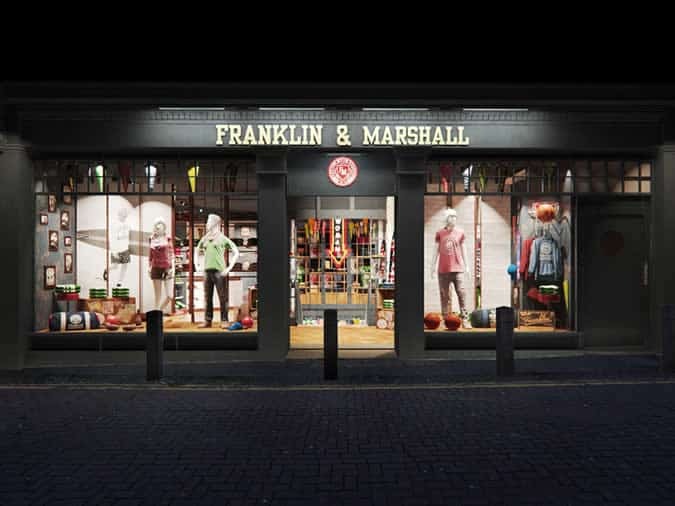 Franklin & Marshall has set up shop in London’s Covent Garden, the Italian label’s first UK store in its fourteen-year history. The new flagship on Neal Street, in the Seven Dials area of the West End, spans 2,654 square feet over two floors. Covent Garden, home to over 150 stores including several international flagships, is widely tipped to become a retail shopping destination for men in coming years. Franklin & Marshall joins other popular menswear brand’s nearby, including Carhartt, Lee Jeans and Diesel. The move comes after a number of successive openings for the label in Dubai, Rome and Tokyo. The main floor of the new shop is dedicated to menswear, while the lower stocks the womenswear line. Exposed brickwork, wood grain floors and neon light fixtures give the space an American College feel, in-keeping with the brand’s aesthetic. Albarelli and business partner Andrea Pensiero founded the brand in Verona in 1999. According to the pair, the name comes from small American liberal arts college located in Lancaster, Pennsylvania. In addition to menswear and womenswear, the store will also sell the brand’s accessories line. Further hints were given about upcoming projects, with the brand saying the new space will make room for planned collaborations and capsule collections, details of which are yet to be released.